Following hot on the heels of the rapidly-becoming-legendary Kamatamare Sanuki over on the island of Shikoku, Hokushinetsu League Division Two outfit Valiente Toyama have also thrown their hat into the ring and announced their intention to go for J-League entry. 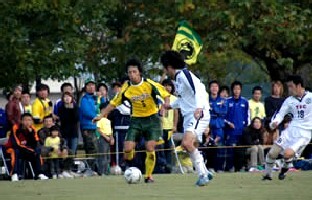 Indeed, the planned schedule for the club's development over the next few years leaves little in the way of room for error, as it involves winning the Regional League next season, then the JFL the year after that and competing in J2 as soon as 2008 - quite a target given that their injury time defeat to fellow Toyama-based side Shinjo Club in the last match of the season just finished means that they have missed out on promotion even to the Hokushinetsu League Division One. But the proposed expansion of the J-League over the next few seasons is clearly something in which Valiente aim to be involved - and if the idea of at least one pro team in each prefecture does come to fruition, however far they may lag behind JFL hotshots Alo's Hokuriku, they clearly hope to be in the driving seat as far as a bid from Toyama is concerned. In parallel with this drive is the establishment in Ishikawa of Ishikawa FC, an organisation that seeks simply to bring pro football to their home prefecture and is therefore currently mainly involved in the drumming up of sponsorship and local government support for the project. What is unclear as things stand on the footballing side is whether the vehicle for achieving the goal of J1 membership by 2015 is likely to be any of the currently-existing Ishikawa-based clubs - such as Hokushinetsu Leaguers Kanazawa SC, Teihens FC or Ferverosa FC - or whether a brand new team will be formed in the coming seasons. The four JFL clubs still remaining in the competition played their Emperor's Cup Fourth Round matches on Thursday afternoon and, although all of them were eliminated at the hands of J1 opposition, two in particular put in impressive performances. Honda FC came closest to causing an upset, forcing a 1-1 draw at form team Cerezo Osaka before going out 4-1 on penalties. Cerezo went ahead through star midfielder Tatsuya Furuhashi on fifteen minutes, only for Honda to stun their hosts by pulling level with a goal from 27-year-old forward Junya Nitta just five minutes later. Honda were left with the proverbial mountain to climb when utility player Yuji Tasaka was sent off mid-way through the second half, but Honda prevented Cerezo from settling on the ball and coped well with the windy conditions to run them close. Come the penalty shoot-out, defender Masayuki Ishii and midfielder Jun Uruno missed their kicks, allowing the home side to squeeze through. Also narrowly defeated were Alo's Hokuriku, by a single goal from young striker Yohei Toyoda just after half time against Nagoya Grampus 8. Alo's put in a strong performance, coping well with the Grampus attack and also causing problems at the other end on the break, with striker Yoshio Kitagawa in particular catching the eye at a rainy Toyama Stadium. Things were altogether less successful, however, for Sagawa Kyubin Tokyo, who travelled just down the road to Kawasaki Frontale - but even so, a shock seemed to be on the cards when, sixteen minutes in, front man Kenta Hori put the part-timers ahead. 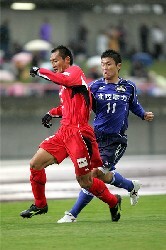 Sagawa Kyubin held the lead until injury time at the end of the first half, only for Kazuki Ganaha to pull Frontale level. Brazilian star Juninho then made it 2-1 shortly after the interval and matters stayed respectable until six minutes from time, when Ganaha, Marcus and Juninho ran in further goals for a 5-1 final score. 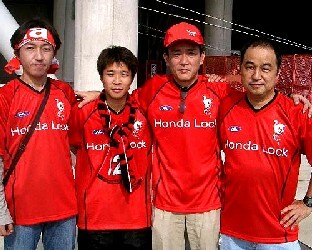 It was JFL strugglers Honda Lock who suffered most of all, though - travelling from their Miyazaki base to the home of J1 powerhouses Kashima Antlers only to be met with a 7-0 drubbing. After conceding an own goal within the first five minutes, it was already 4-0 to Kashima mid-way through the first half. Just to make matters worse for the non-leaguers, Chikashi Masuda - a native of their own home prefecture - notched up a hat-trick for Antlers to rub salt into the wounds of the visiting fans.